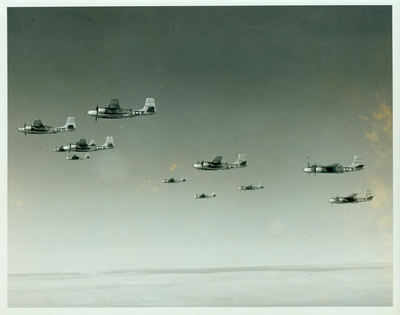 Black & White photograph of ten Douglas A-26B Invaders flying in formation by the Ninth Army Air Force, 552nd Bomb Squadron, 386th Bomb Group. The Invaders have the letters RG painted on the fuselage of the planes. Identified planes are K, M, B, T, X, and Z, circa 1944-1945. Pittsburg State University, Special Collections, 6, Watkins, Arnold Clayton, Envelope 3, 02. Contributed by Joan F. Watkins.